SMVDU Jammu, April 9 2019: At Shri Mata Vaishno Devi University (SMVDU), Katra learning and playing go hand-in-hand. Vice-Chancellor, SMVDU, Dr. Sanjeev Jain states that the spirit of learning and to progress ahead is ever kindled by sportsmanship. 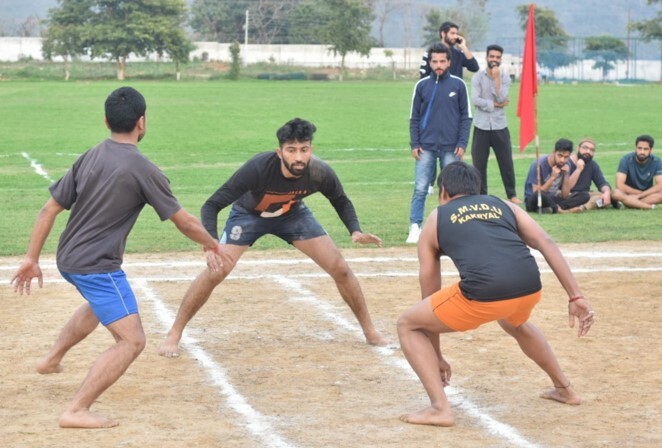 An inter-house Kabaddi tournament was organized at SMVDU, Katra under Annual Sports Fest, ‘SARANG’ 2k19. Total 10 teams (5 boys and 5 girls) from different Houses participated in a four day tournament,catering and capturing the interest of the young talents. Among 10 different teams Vayu House and Jal House for boys secured their berth for the final match. Aakash House was able to secure the 3rd position under captain ship of Mr. Nakshatar Sharma. Among girls, the Vayu House will face the Prithvi House in the finals and Agni house was able to secure the 3rd position in close encounter between Agni and Aaksh by the point difference of 5 under the captaincy of Miss Ria Manhas. The tournament was co-ordinated by Mr. Rahul Sharma. Coach Mr. Sucha Singh, Mr. Balbir Singh and Mr. Sumit Sharma who officiated the tournament. Dr. Yugal Khajuria, Dean, Students Welfare, SMVDU and I/c Sports, SMVDU, Rajiv Kumar conveyed their best wishes to the finalists.